KioWare for Windows allows you to create Scheduled Actions, which are automated time-based tasks related to your device, KioWare, content, and more. 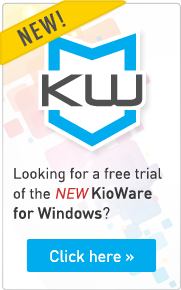 KioWare for Windows version 8.0 and newer allows you to create Scheduled Actions, which are automated time-based tasks related to your device, KioWare, content, and more. Open the KioWare for Windows configuration tool and click on the Scheduled Actions tab. Click Add New. Give the task a name, then choose the desired action from the Action to Perform dropdown menu. You have options such as putting the kiosk to sleep, shutting down the kiosk, rebooting the kiosk, updating content, and more. Set the Start date by choosing a date from the calendar, then choose a start time. If you’d like the task to repeat, click the Off button beside Task Repeats so that the button now says On. Choose whether you’d like Hourly, Daily, Weekly, or Monthly, then adjust the applicable settings on the right as necessary. For example, if you want to set the task to repeat Weekly, you would choose how often – every 1 week, 2 weeks, or whatever your preference is, then you’d check the box for the days on which you’d like the task to be performed. Below Task Repeats, you can also set an End of Repeat Pattern. Choose whether you’d like no end date, end after a specified number of occurrences, or end by a specified date and time. The KioWare for Windows config tool automatically saves any changes you make so now your Scheduled Action is set and ready to run. Click the Back button to view your list of Scheduled Actions. You can create multiple actions to suit your needs. Just click the Add New button again to create additional actions. Scheduled Actions are useful tools for keeping your kiosk running smoothly. If you have any questions about these actions or the Scheduled Actions tab of the KioWare for Windows config tool, just contact us and we’ll be happy to help.